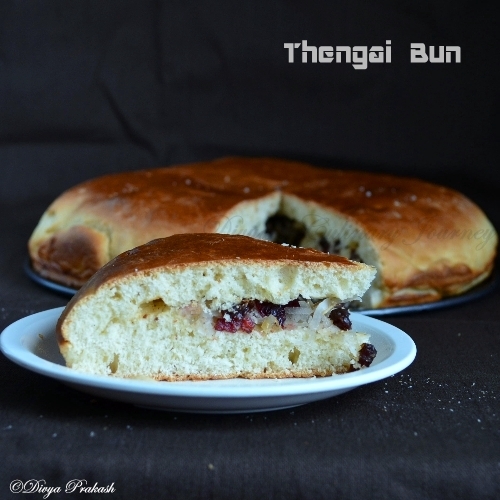 Today's recipe is Thengai Bun. There is a flashback story behind these buns. Near my home in India, there is a bakery. Every day around 3' o clock, they will bake these buns freshly, the whole area will be aromatic. When we are at home during holidays we will get these buns for 2 Rupees a piece and enjoy it warm. Not only me, after marriage, even my Hubby became a fan of those buns. 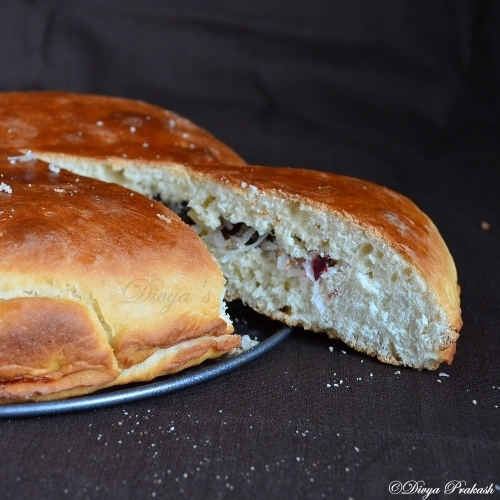 I wanted to bake these buns for really long time, I found this recipe from Julie's site. I didn't know it is called dilkush too, until I read in Julie's post. I tried this and we all loved it. In 2 tablespoons of warm water (around 110 F), mix the yeast and wait for 8- 10 minutes till it is frothy. Combine salt, sugar, flour, mix the warm milk, then the yeast mixture and then the beaten egg and keep kneading adding water little by little till they are well combined and forms a sticky dough, then add the oil and knead for few minutes. Generously apply oil and cover it and let rise for about 2 hours. In the mean time prepare the stuffing by mixing all the ingredients(coconut flakes, dry fruits, nuts, sugar & cardamom powder) together. After 3 hours, the dough would have doubled in size. Deflate the dough and knead it well. Roll one dough into 9 inch diameter, fill in the stuffing and roll the other dough large enough to cover this. Seal the edges properly and apply the egg wash and let it rise for another 30 minutes. Preheat the oven to 375 F and bake the bread for about 15- 20 minutes. Cool the bread for few minutes and slice and serve it warm. Take care to seal the edges properly otherwise it will look like sandwich and the stuffing will come out. You can shape the bread and bake in a cookie tray or you can use a round baking pan. A lovely bun. Looks soft and spongy. Same pinch, these buns were made near our home in my native too, I oove the aroma from the bakery.. Ur buns look so good Divya!! Bun looks soft and fresh..even I love buns. Wow my fav, perfectly made...but here these coconut filled buns are called as "dilpasand" while "dilkhush" has cake-leftovers as fillings. so soft looking bun.. well made dear..
My favourite snack as kid.Bookmarked.Tempting clicks. My favorite,looks soft and delicious. Thanx Divya for the try,happy that u liked it..Thanx for mentioning my space dear,Loved the last click..Picture perfect!!! Beautiful clicks, I love dilkush. Yummy ones. You are making me all nostalgic. Delicious thengai buns I love it. Worth it Divya..When you recreate something so nostalgic,it will be ! Loved it. Divya super thengai bun. I remember the chennai bakery how special this bun is. Love this bun very much. 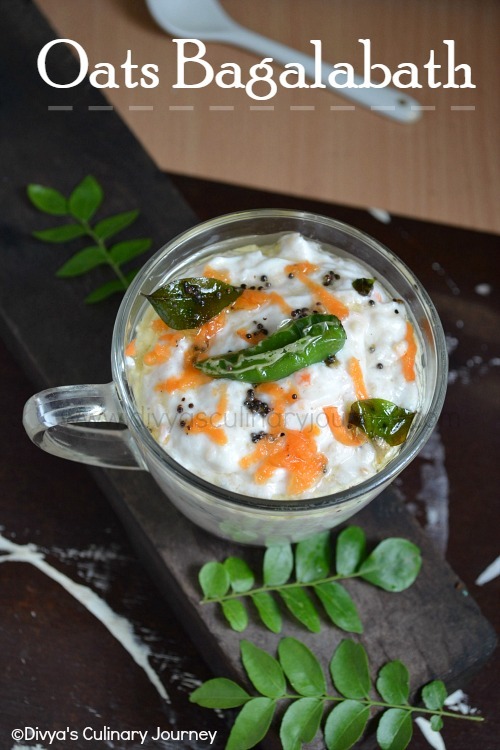 Happy Pongal dear.looks yummy! Those buns look just perfect. Love the coconut filling.. I have always had a savory stuffing in the buns, but this is soo different and unique. Would love to try it out! Love these buns..I too have memories linked with it..:) Perfectly done dear..
Thengai buns are looking super yummy. 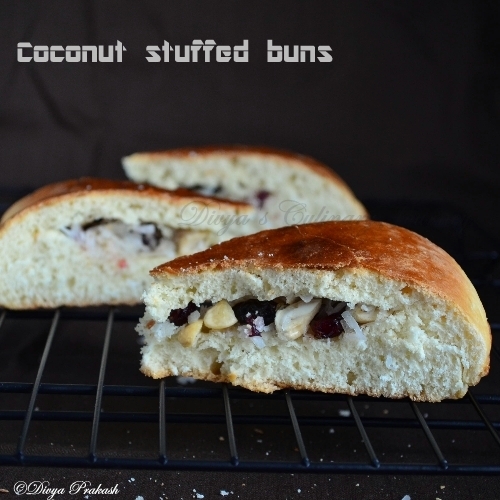 Hi, I am Chandrika.I made coconut buns today and it turned out to be very very good.I made a slight variation by frying coconut in ghee lightly.Also added cashews,raisins and cherries.Keep up the good work!! !